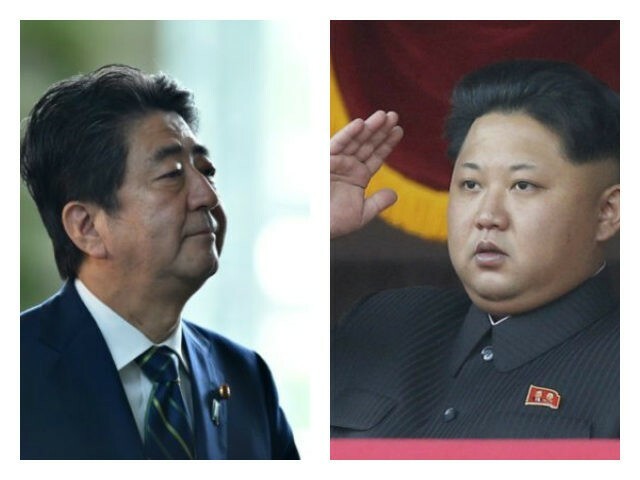 A source within the Japanese government said on Tuesday that Prime Minister Shinzo Abe may seek a meeting with North Korean dictator Kim Jong-un, presumably at some point after U.S. President Donald Trump meets with Kim, assuming that summit does indeed occur. According to Reuters, the unnamed Japanese official said the Abe administration is “considering” seeking a meeting with the North Korean leader. High on the agenda would be the fate of Japanese citizens abducted by North Korea over the years. North Korea has admitted to kidnapping 13 Japanese, although the full number is probably much higher. Of the 13 acknowledged victims, five were returned in 2002, while the North Korean government insists the other eight are dead. “After that, while liaising closing among the three countries, we will address how to comprehensively resolve the nuclear, missile and abduction issues. Amid that, we want to consider what would be most effective and address the issues from that perspective,” he said. A Japanese lawmaker more explicitly stated that North and South Korea should hold their summit first, and the proposed Trump-Kim meeting should occur afterward before Japan considers arranging a summit meeting with North Korea. Reuters mentions the cronyism and cover-up scandal currently dogging Abe, implying without clearly suggesting that a big diplomatic win over North Korea would benefit his troubled presidency. In the NYT’s account, Abe looked like a “forgotten friend asking for details of a party he missed over the weekend” as a South Korean envoy informed him about the possibility of Trump meeting with Kim. Analysts quoted by the Times also thought Abe looked a bit desperate by quickly announcing he would travel to America for a meeting with Trump to get back into the loop. Abe additionally has to deal with the political fallout from Trump’s steel tariffs, which Japan and South Korea feel especially wounded by given their staunch support of American policy on North Korea. Conversely, some analysts feel Abe’s political position in Japan will be strengthened by public anxiety over the North Korea situation, as voters who might otherwise turn against him over the cronyism scandal decide he is the best leader Japan could hope for in a precarious moment, and indisputably the only top Japanese politician who can claim to have a strong relationship with President Trump. The unsubtle subtext of the New York Times’ sources is that Abe might desire a meeting with Kim to ensure Japan’s interests are not entirely forgotten as Trump hammers out some historic deal with the North Korean regime. Foreign Affairs adds that Abe is well aware of North Korea’s penchant for demonstrating its long-range missile capabilities by shooting them over Japan. If Kim wants to terrorize a U.S. ally without triggering a doomsday confrontation with South Korea, matters of geography and uncomfortable history suggest Japan will be his likely target. Japan has arguably been more consistently worried about North Korea’s nuclear missile program over the past three decades than the United States, or even South Korea. Tokyo seeks a leadership role in the evolving Pacific alliance against China, so it can hardly afford to be seen as a spectator as Washington, Seoul, and Pyongyang work on a resolution to the nuclear weapons crisis. Abe has consistently pushed for changes to the pacifist Japanese constitution to give his country greater initiative in self-defense and make it a player in regional power struggles. For all of these reasons and more, the Japanese public would not look kindly upon Abe for accepting a seat on the sidelines as the next act in the North Korean drama plays out, for better or worse.